Excellent graphic below from Vizual Statistix showing the average percentage of wagered money won by a casino on games in Vegas. For example, it shows that the house wins about 11% of the wagered money on blackjack, so if you put down $100 at a table the statistics show that the house will collect $11 of that money on average. 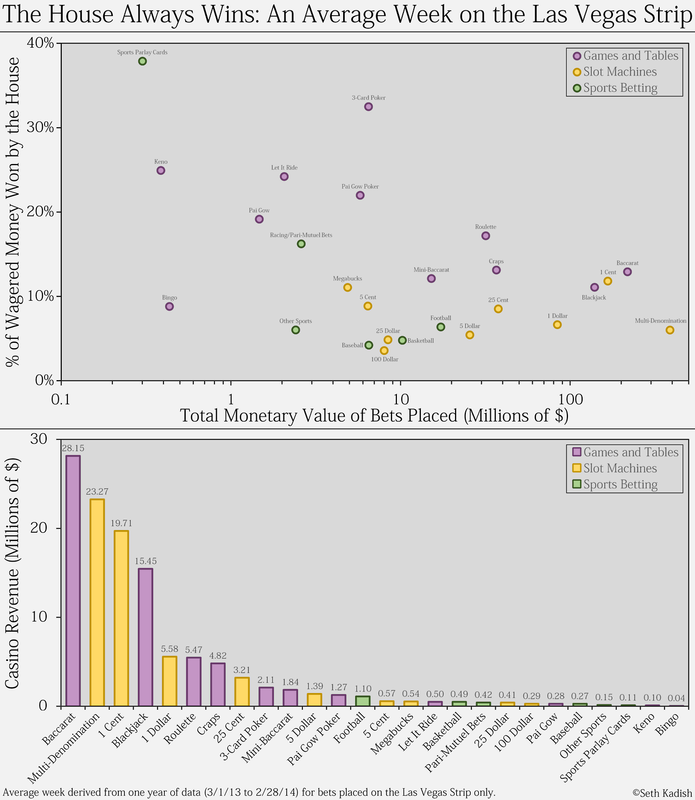 Other popular games are craps (14%), roulette (17%), and baccarat (14%). Enjoy playing 3 card poker? The house takes over 30% of what is waged! Incredible. Their biggest winner comes from sports betting parlays at close to 40%. I read an article earlier this week on the part of the brain that makes gamblers believe they have a "hot hand" or something other than statistical probability that will change the outcome of their next bet. The same process is involved with stock market participants who believe they can time the market based on the "feel" of what is coming next on the ticker. Vegas studies always provide an excellent microcosm of the stock market which is the largest casino in the world and driven by irrational human psychology. It may be tough to read the graph below even after clicking on it. Click here (and keep clicking on the graph) for the best zoomed in view. Matt Taibbi walks through why Wall Street criminals no longer operate under the same code of law as the rest of America. This is the subject of his new book "The Divide." Watching these interviews, I would not have been surprised if you told me that Taibbi is 25 years old. Just for fun, guess his age and then scroll down for the answer. 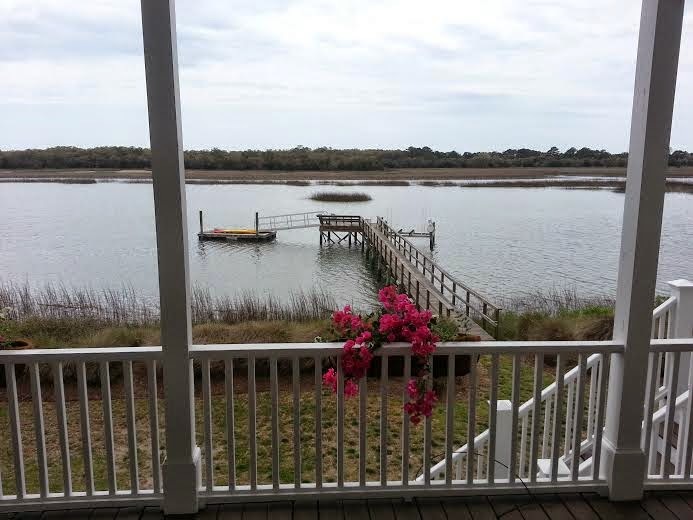 I've spent the last few days down in beautiful Kiawah Island, South Carolina, where my in-laws have a gorgeous home right on the water. In between fishing and eating great seafood I've been devouring Jim Rickards new book "The Death Of Money." The title makes it seem as if it is just another walk through on how the U.S. dollar will fall due to too much debt and too much printed money. The book looks about 25 steps beyond that, explaining how and why the major players and pieces around the world will shift during the changes in the years ahead. While the release of Flash Boys received all the attention last week, Rickards' books is by far the better read for someone trying to understand how the world will be reshaped as we move forward. He begins by walking you through his experience working with the U.S. Department of Defense on financial warfare. He mentioned this topic briefly in his first book, Currency Wars, but he devotes the entire first section of his new book around what research took place following September 11 on the trades that were placed (very profitably) before the crash. He then walks through what the U.S. has done since then, which sped up again following the 2008 panic, to prepare for financial war. He concludes that the U.S. is completely unprepared and walks through how an attack would occur. In section two he begins taking you around the world with an incredible chapter on how and why China's coming crisis will unfold. Then he moves to Europe where he explains why he is bullish on the long term prospects in the region. In 2011, during the height of Europe's sovereign debt crisis (so far), Rickards was perhaps the lone bull on the future of the euro (I listen and read just about every interview he takes time to give so I remember the call clearly). This call turned out to be correct as the euro has rallied heavily off those lows. Jim then moves to the BRICS and BELLS, groups of countries that have been banded together based on economic similarities. His case study of the BELLS is fascinating because it shows a group of European countries that allowed their economies to contract heavily following the 2008 crash. They did not provide government debt stimulus and they did not print money. Their countries suffered a brief recession/depression and they are now enjoying a V shaped recovery. 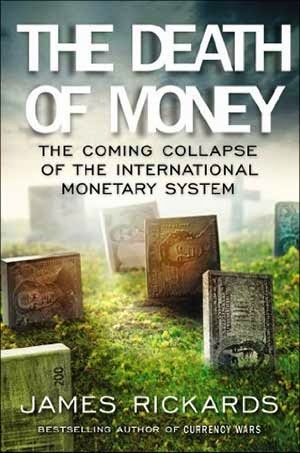 He finished the book walking through the role of the IMF, which is the central bank that backstops the central banks around the world. During the next crisis the IMF will play a major role and most likely we will move to a new currency system that involves SDRs (special drawing rights); the currency the IMF issues. I could write for hours on the topics within the book, and I will be moving through some of the topics in far more detail in the weeks ahead. The book is an intoxicating stream of information from one of the greatest financial minds of our time. Rickards is not some economist from Princeton writing an economic think piece. He has 35 years of experience working hands on in the capital markets. Flash Boys is great to listen to because it is told in story form. The Death of Money is best read by Kindle or paperback, by a beach or ocean if possible.